It’s almost holiday gift-giving time, and you’re probably thinking about the search for the perfect, thoughtful gift for clients, friends, colleagues, and family. In thinking through my favorite gifts, among them are the books I’ve received. You can probably think of more! How do you pick the perfect book for each person on your gift list? I’ve put together a list of my author’s books, along with the ideal reader AND the link to Amazon. Make holiday gift-giving easy and personal at the same time by using this shopping list! Presenting financial information by putting the needs of the audience before yours will compel you to become a more confident presenter and deliver information with clarity. For sales managers, sales leadership, human resources (recruiters, generalists, managers and leaders), sales trainers. Identify the root of all evil in your sales force before they can derail your entire organization and cost you a fortune. For anyone looking to find fulfillment in life. Whether they are seeking for more or looking for continued inspiration, it’s a perfect fit for anyone! Spurred to capture everyday moments turned extraordinary, Color Today Pretty takes you on a personal reflection – traversing life’s difficulties and also finding beauty in the mundane. 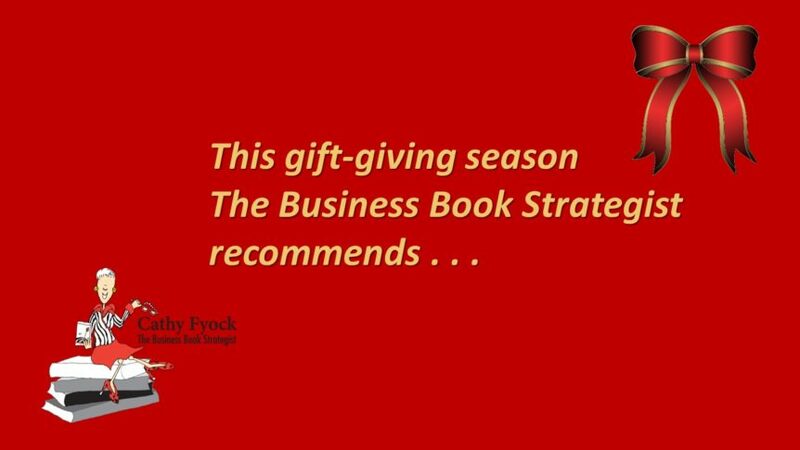 For entrepreneurs or business professionals who use speaking as a tool to promote or grow their businesses. PFH is a quick, engaging, thought-provoking read, providing accessible and practical lessons on improving your attitude, performance and audience connection while delivering meaningful and memorable presentations. This book is about the business of speaking and how to get paid to speak, and includes specific strategies, scripts and information provided for you to jump start a speaking business or take your current business to the next level. If you want to write a book as a business tool, On Your Mark provides a step-by-step guide to writing your book fast! For professionals and thought leaders who are interested in writing blog posts that could become their next book. If you’ve been blogging a post each week for a year, you probably have enough content for a book. See how to put it all together in this blog2book model! This unique and powerful book written by a team of HR and OD leaders explores the nuances of bring our whole selves to work, and challenges us to shed the outdated notion of asking employees to check their humanity at the door. This volume explores what it means to offer a compassionate workplace, sharing messages about wellbeing, work/life balance, diversity and inclusion, personal and professional development, and spirituality at work. For people with challenges to overcome, athletes who set the next goal of races to run, for those who know the power of attitude, regardless of abilities or disabilities. Imagine three wheelchair racers setting and completing a truly audacious goal: Finishing 50 marathons in 50 states in 50 weeks, journey that’s as life-changing as it is inspiring. For small business owners or HR professionals who need expert guidance to hire the right people. The YOLO Principle teaches a proven recruiting strategy to attract and hire the high-performing team members they need to be more efficient, effective, and profitable. For executives and managers who lead a team of people and want to develop them to be star performers with greater contribution to the organization, their team and their own growth. Packed with stories and skills-building techniques, this is the most valuable one-stop tool for growing your role as a coach to your team that will produce extraordinary results for the person and the organization! For any expert or thought leader (business person, speaker, consultant, author) who wants to build name recognition in front of their target market. Everyone reads magazines and online content. Build your business name recognition by placing articles in front of your target market where they already are. For anyone looking to find and keep a long term, committed relationship, primarily women between the ages of 25-45 who want to get married for the first or second time. “After Ever After,” will give you the tools you need to find and keep the love of a lifetime. This book will help you remove the artificial barriers that may be keeping you from your next mentor, star hire, or big customer. For people continuing their personal journey and experiences. Each of us is on a journey, a quest. Sometimes we need help with our roadmap. Sometimes we need help folding our roadmap. Do we know which we need and when? This book is about leading in a very personal way. Rob shares his 27 years of Army leadership. It’s about knowing yourself, knowing your people, and investing in them. For leaders in any organization who track performance metrics about their business results. This book provides a method (“Process Behavior Charts”) for leaders to visualize metrics in a way that helps them react less, lead better, and improve more. For anyone that has reached a point where they feel like, “there’s got to be more to life than this.” Anyone who is tired of feeling stressed, sick and tired. Anyone who feels like they’ve got too much in their life… too much clutter, too much noise, too much stuff… and wants to simplify and get back to what really matters. Live a F.A.S.T. is part memoir and part help guide, about how the author found her life by stripping it down and cleaning it up, and how you can do the same. For managers and employees who work with jerks. How to Work with Jerks offers solutions for professionals and leaders who want to motivate and retain their staff. For those who have faced adversity and want to build resilience. One of the first women graduates of West Point shares her experiences to arm others with leadership skills needed to fight “battles” in their professional and personal lives. Why are employee turnover rates skyrocketing? Staying Power explains how the workforce has changed in the last 10 years and what leaders can do to keep their top talent from walking out the door.